Orange Early Childhood offers a quality, developmentally appropriate curriculum that aligns with the Ohio Department of Education Early Learning and Development Standards. Below are the areas of development to which we align our curriculum. Every day, teachers integrate physical development activities in their lesson plans. These activities take place in the classroom, gym or playground. Examples of indoor classroom physical development activities may include: dancing to music, playing a bean bag game, painting, drawing with crayons, stacking blocks, playing with water using a sensory table, cooking, using playdough, and many others. Our teachers also have the opportunity to use the gym for physical development activities such as: walking on a low balance beam, throwing and catching a ball, obstacle courses, playing Follow the Leader or Simon Says, allowing children the opportunity to run, gallop, skip and walk, among many others. The playground is a large outdoor space where the children have ample opportunities to climb on the various structures, ride the tricycles, swing on swings, draw with chalk, run, gallop, walk, explore the natural environment, play in the sandbox and explore their bodies in space. Every day, teachers integrate Social and Emotional Development activities into many formal and informal classroom experiences. Formal classroom experiences may include talking about our feelings that day, singing songs, reading books about feelings and emotions, creating Venn Diagrams to compare and contrast similarities and differences, modeling appropriate social interactions and creating a consistent classroom routine. 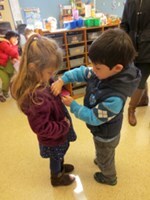 Informal classroom experiences include comforting children that are upset, creating an environment that allows children freedom of choice and discovery, personalizing cubbies with photos and names, calling each child by their name, smiling, greeting each child upon arrival and reaffirming each child’s sense of self. Teachers integrate experiences that allow children to explore a variety of Approaches Toward Learning. We plan and implement activities such as: block play, dramatic play, asking open-ended questions during group time, encouraging children to use positive expressions, emotions and language, going on field trips, bringing in community visitors, talking about safety procedures, allowing children time to learn in whole group, small group and individual sessions, utilizing open shelves that are accessible to children to explore materials on their own and encouraging children to play with the materials provided in the classroom. Every day, children are given the opportunities to explore various aspects of Language and Literacy development. Children in all of our classrooms are read to every day, for at least 15 minutes. In addition, activities are planned in this area with activities such as, asking open-ended questions, introducing new vocabulary, engaging in word play (such as rhyming, non-sense words and alliteration), encouraging children to talk in a variety of ways and re-reading books. We also encourage language and literacy by encouraging children to express themselves using words, modeling appropriate language skills, charting children’s responses, encouraging development of writing by encouraging children to make marks on paper, encouraging their attempts to write words and letters and by providing a print-rich environment. The curriculum guides our teachers to integrate the subject areas of math, science and social studies into our everyday activities. We provide a consistent, predictable schedule of daily events. Our learning centers are changed and enhanced to reflect the weekly classroom theme and we encourage children to engage in play activities throughout the day. We encourage cognitive development by exposing children to activities such as counting objects, graphing, conducting science experiments and charting responses, patterning with a variety of materials, exposing children to a variety of cultures and abilities in materials we place in our dramatic play centers, comparing similarities and differences, providing opportunities for group games, asking children to make predictions and encouraging problem-solving skills.